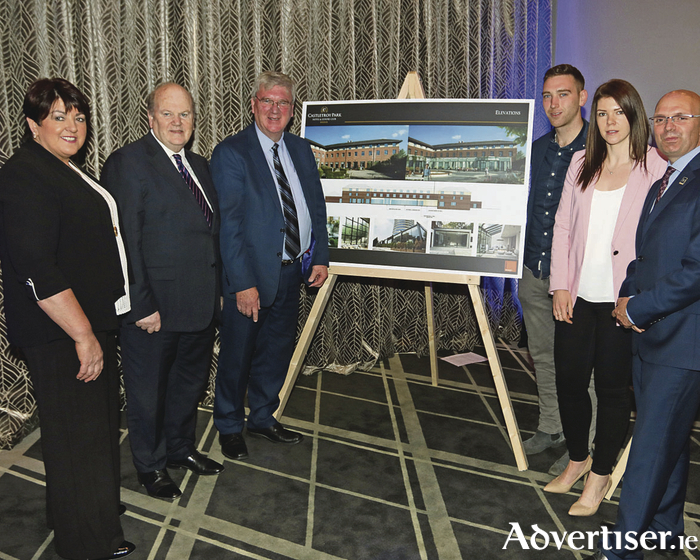 The owner of the Castletroy Park Hotel Limerick, Pat McDonagh, has announced a significant expansion plan for the Limerick Hotel. The plan includes increasing the size of the hotel by almost 50 cent above its existing 107 bedrooms and executive suites, a new state of the art fitness and leisure facility and a corporate business hub. The plans were launched this week by Mr McDonagh at an investment and jobs announcement attended by the Minister for Finance, Michael Noonan, TD. The development will see €6million invested in the Limerick economy over the next 18 months and 110 jobs will be supported during the construction phase of the project. An additional 40 permanent jobs will be created in the Hotel itself. The project will generate an estimated €30million in the Limerick economy over the next ten years. Speaking of the city as a location for business Mr McDonagh said that few places in the country come near Limerick in terms of what it offers the corporate, leisure and sports tourism sectors. “A recent study indicated that Limerick has overtaken Dublin in terms of job vacancy rate. The region is now a business hot spot and the physical infrastructure around the city is changing dramatically. There is a significant motorway network feeding the city plus an international airport in Shannon on our doorstep,” Mr. McDonagh said. Mr McDonagh said the Castletroy Park Hotel which was originally founded by Chuck Feeney, the noted American philanthropist, was envisioned from the very outset as a top-rated facility complementing the status of the University of Limerick status and he is committed to continuing to deliver on that vision. Mr. McDonagh, who is a graduate of Mary Immaculate College, described Limerick as the Irish ‘capital of education’. He said this investment is a vote of confidence in Limerick and he said he is hugely impressed with the success of the city in attracting national and international business investment as well as the progressive steps being taken to address lifestyle, amenity and urban development. In particular, Mr McDonagh said he sees the city becoming the capital of Education in Ireland. He praised the University of Limerick which he said has grown from 100 students 40 years ago to being currently one of the biggest and most enterprising Irish universities. He said the recent appointment of Professor Des Fitzgerald as UL President is testimony to the ability of the institution to attract the best and brightest to Limerick. Mr McDonagh said that developments at Mary Immaculate College and Limerick Institute of Technology have paralleled the pace of development at UL and he said the student population of the city is now on a par with the total population of most Irish county towns. Mr McDonagh went on to say that Limerick is now reaping the rewards of its reform of administration into one single city and county municipal authority. “I believe that the reformed council, under its CEO Conn Murray, will lead Limerick to a prime place among international city’s,” he said. Mr. McDonagh summarised by stating that the investment in Castletroy Park Hotel is focused on guaranteeing the hotel’s pole position into the future, complementing the high standard of development and expectations of the city.